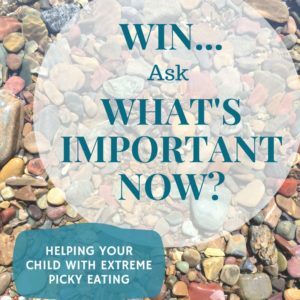 One of the main reasons parents and teens seek out help for persistent or “extreme” picky eating has less to do with what they are or aren’t putting in their mouths, and more to do with the very human drive for social connection; the child who misses out on parties or sleepovers because he is anxious he won’t find anything to eat, the tween who skips the block party because of comments from neighbors, the teen who won’t eat in front of others and dreads dating. Selective teens and adults tend to have more anxiety around eating with others, and social anxiety in general. It makes sense; most of our social gatherings and celebrations revolve around food and meals, and people seem to love to talk about what others are or aren’t eating. 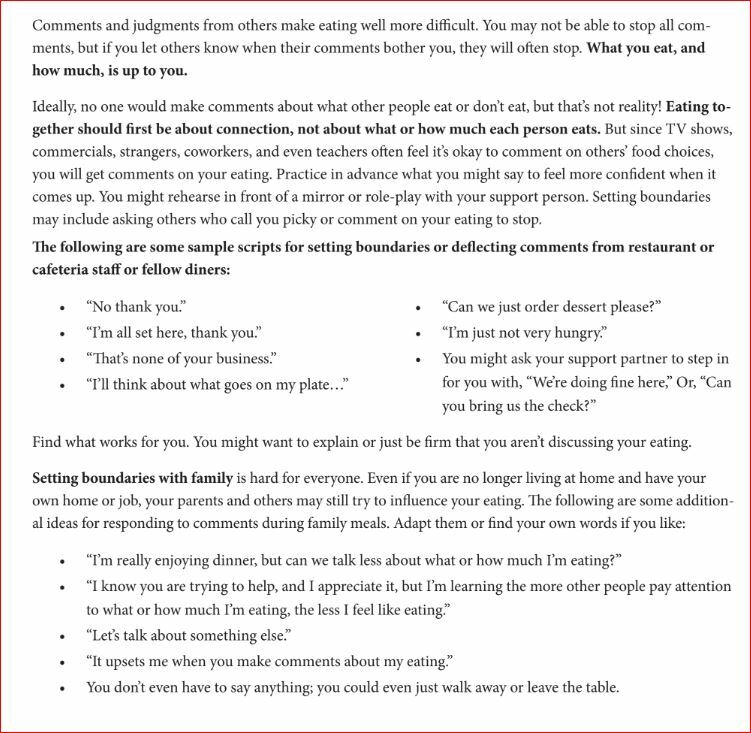 The following are some tips on helping children and teens who are selective eaters avoid isolation and stay connected. Stay connected... it's what's important now. Staying connected to parents: It’s not worth damaging your relationship with your child for short term goals. Meals ending in tears, mealtime “hostage negotiations” and conflict over getting your child to eat will likely make her eating worse, and can push a wedge between you and your child. Focus on pleasant mealtimes and routine meals and snacks. 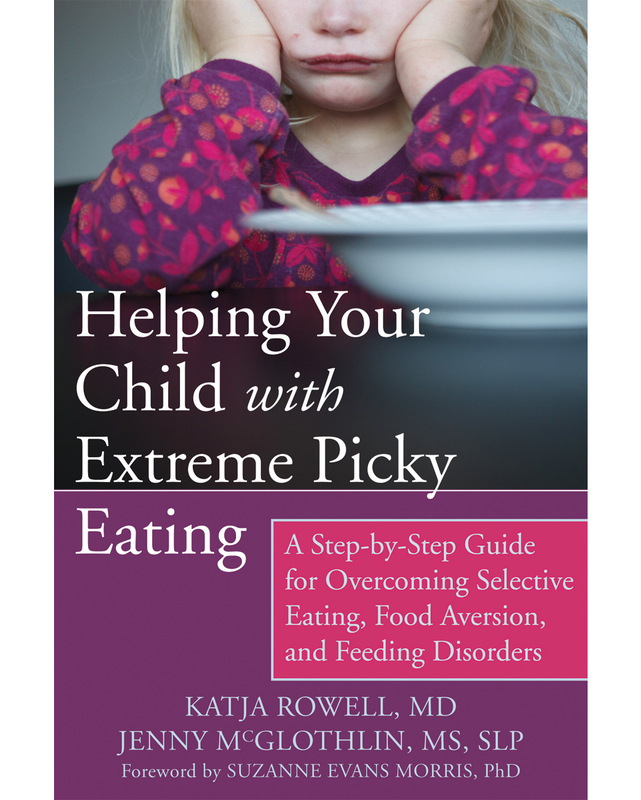 Our book Helping Your Child with Extreme Picky Eating tells you how, step by step. Protecting your child from outside pressure: Comments, teasing, shaming from family, friends and teachers can make your child self-conscious about eating with others. You may have to talk for your young child to fend off pressure. Learn some phrases that help such as, “Please follow my lead” when talking with family. As children get older they can be taught to fend for themselves, which is still pretty hard to do! Give your children permission to say “No, thank you.” Skye Van Zetten of Mealtime Hostage blog shared in our book how she protected her kids from interference: “I fended off several comments directed at my kids from around the table, ‘Aren’t you going to eat that/finish that/ try that?’ My response was to always address my child and ask, ‘Are you full?’ ‘Yes,’ they replied. I’m pleased to say that was all it took to make the requests stop.” Even “My mom says I don’t have to eat anything I don’t want to” can help. Here are more ideas. Pressure-free at school: Having that talk with your child’s teacher is rarely fun, but protecting your child from pressure at school can make a big difference. 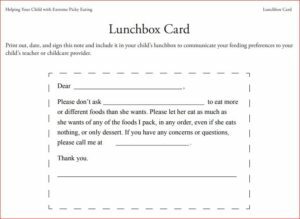 For young children, you can include our “lunchbox card” in their packed lunch that your child can hand to a teacher or staff. Some schools have “eat this before that rules” or make children eat certain amounts before they can access recess. For anxious selective eaters this often means humiliating scenes or missing out on social activities. We think this is harmful, but changing school/daycare policies can be a battle. Good luck! Eating out: If your child is already anxious about eating out, again focus on having a pleasant time, not on what they eat. You might look up restaurants in advance, have your child look at the menu and see what they might be able to order; they might only eat bread or fries or dessert. We love buffets as they take some of the pressure off. Get a plate with various small finger foods and a few dips and put it in the middle of the table as “appetizers” so everyone can try what looks good to them. Make sure your child isn’t starving before you go so that doesn’t add to the anxiety. You can take an accepted food with you as well. Parties and eating at friends’: One parent shared how she used to try to use social events as leverage, “I told him he can’t go to the neighbor’s party if he doesn’t eat the food they serve.” Predictably, her son chose to stay home. While mom thought she was doing the right thing to entice him to expand his eating, it backfired. He didn’t eat more, and he is further isolated and embarrassed. I suggested Mom work to include her son in the future. Think of something he can eat happily and bring plenty to share. They decided on two bags of his favorite tortilla chips and salsa. Even if all he ate was the chips, he could go knowing he would have something to eat. A few months later Mom reported that at one of these parties, he tried a new food all on his own– chicken kebabs. Parties without pressure can actually be a great place to try new foods, especially if there is a buffet set-up and no one is making a fuss. Kids can see others enjoying the food, and while they are playing, might sneak a bite of something new. For teens, peer relationships become even more critical. All of the above still applies, but developmentally teens are striving for more independence. No-pressure family meals are still important, but facilitating their relationships fosters better mental health and well-being. Connecting is so important that we chose a cover that features a group of young adults enjoying each other around a table. The food isn’t the main focus, the connection is. Focus on connecting with you: If meals are too stressful, connect away from mealtimes. Find a few things you enjoy doing together and make the time to do them. Work on not pressuring them to eat and try one or two meals a week together. Start with weekend breakfast or another less stressful option if dinner has been the site of major show-downs. Empower them to realize their eating doesn’t define them: Help them focus on and build skills around hobbies, get out and volunteer, find an art or yoga class, or whatever interests them. Give them tools: Teens are working on defining who they are as individuals. Suggestions coming from you around their eating may be met with resistance even if you are offering options, not pressuring. 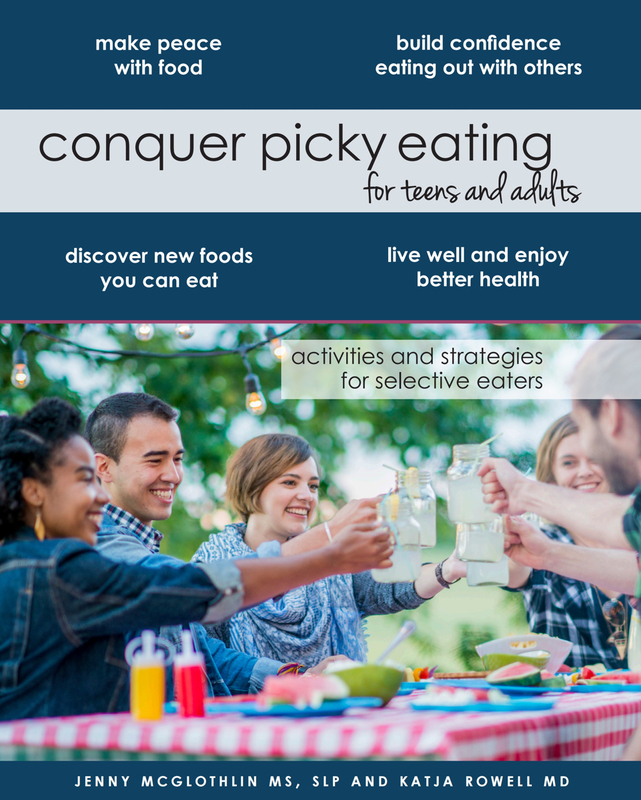 It’s why we wrote our book, Conquer Picky Eating for Teens and Adults. Teens need to “drive the bus” and work on their own relationship with food. We asked a therapist to offer tips on giving a “self-help” book to a teen.